The church of San Frediano in Lucca is where one of Lucca’s most beloved saints, Santa Zita, has her chapel. Santa Zita, the patron saint of servants, was born in 1218 and was sent to work for a wealthy family when she was twelve. She was well loved by her employers, so much so that another servant was jealous of her. One day Zita’s rival decided to tell on her for breaking the house rule: no foods should be taken from the house to give to the poor. The snitch saw Zita putting some old bread in her apron and did what snitches do: snitched. When Zita’s employer saw her leaving the house he asked her what she was hiding in her apron. She answered, “Flowers, sir.” He demanded to see the flowers. Zita said a quick prayer and opened her apron. It was full of flowers, a miracle. 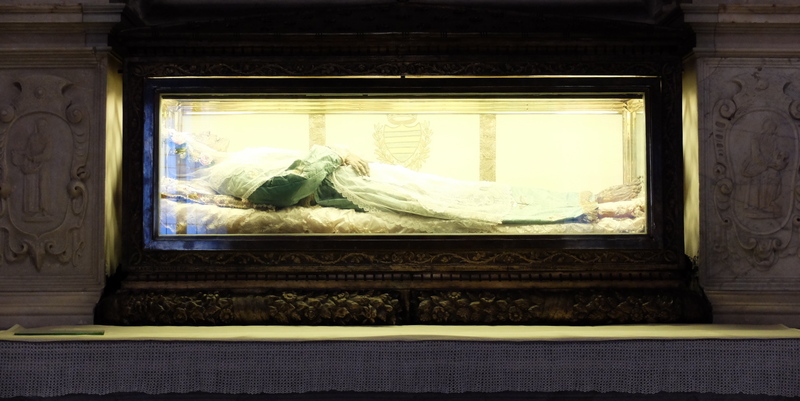 Zita’s body, displayed in a glass case above the altar in her chapel in the church of San Frediano, has been declared “incorrupt” by the Roman Catholic Church. Catholics believe that Divine intervention keeps the bodies of some special people, especially saints, intact after death even if there has been nothing (like mummifying work) done to preserve them. Zita died in 1278, over seven hundred years ago, and yet there she is, barefooted, wearing a lovely silk dress with a lacy apron. Only a little worse for the wear and tear. Even if you go to San Frediano for ghoulish reasons, please remember that Zita is a saint and as such should be venerated, not gawked at. If seeing a dried up old lady in a fancy dress makes you want to squeak, don’t. Be respectful.